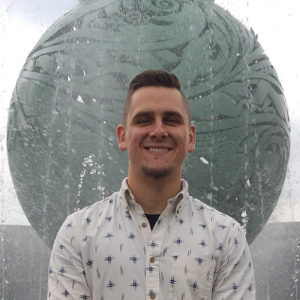 Devon Zurcher is in his fourth year of his Bachelor’s of Science in Architecture and Environmental Design at Bowling Green State University (BGSU) and currently serves as the AIAS Chapter President. He has been an active member of AIAS BGSU since his freshman year. Before his election as the Chapter President, he served as the freshman representative and was Vice President his sophomore and junior year. Throughout his years on the BGSU AIAS executive board, Devon has helped the chapter focus on developing student’s designs, graphics, presentations, and portfolios as well as aggressively networking to promote Bowling Green State University Architecture. “We have implemented a new program we call, “Create.” that focuses on projects in the liberal arts as well as architecture and urban development,” said Devon. He credits the program to an increase in membership and a better overall interaction among all years within studios. The chapter continues to improve the program and hopes to see it on a national stage one day. The Design Think Tank is a special committee responsible for investigating and enhancing the relationship between AIAS and design in schools of architecture, highlighting how the AIAS can become a venue for leaders in design. Maria Hurtado serves as the chair for the special committee. “Devon has been extremely dedicated to the Design Think Tank, continuously contributing and helping us move forward. He has been essential to the ideas that the think tank has come up with,” said Maria. Devon recently finished an internship in Cleveland, Ohio working for Sandvick Architects, and he looks forward to working there again this summer. He currently works as a Structures and Math tutor for BGSU. On top of tutoring, AIAS, and balancing studio, Devon is also in the process of applying to graduate schools to further his knowledge in the architectural field.